Your hermit crab will likely start to act and look a bit different just before molting. 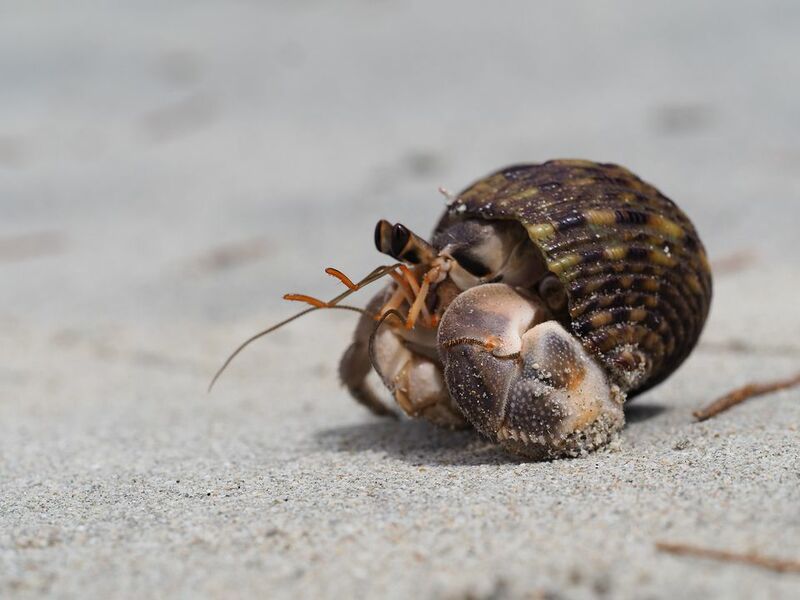 Be prepared for molting as some hermit crabs may surprise you when you least expect it. Keep a close eye out for the signs below so you can support your molting hermit crab through this stressful time. Once these signs manifest, consider isolating the hermit crab from the other crabs. The entire molting process consists of several stages: preparing for the molt, shedding the exoskelton, the hardening of the exoskeleton, and a recovery period. The shedding doesn't take very long, but the stages that proceed and follow the shedding often take some time to complete. A crab will bury itself when molting begins and it's best to leave a hermit crab alone and let nature take its course. Check on them occasionally by looking in on them, but don't pick them up as you can cause damage. A healthy crab that is suddenly digging more than usual is a sign that molting is approaching. However, first check your thermometer and humidity gauge. If a tank is too warm, cold, or dry, your crab cold be trying to dig a new habitat underneath the sand to get away from unwelcome conditions. Eating and drinking more than usual for a bit before the molt could be an indicator as molting hermit crabs first store up a lot of fat and water and gorge like crazy! However, all of this overeating usually takes place at night when you're asleep so you likely won't see it. A crab will usually store extra fat and water in a small black "bubble" on the left side of the stomach under its fifth pair of legs, though this is not always the case. This molt sac stores water to help break the exoskeleton when it molts. In the last few days before starting a molt, your crab may stop eating. Tangled-looking antennae and less antennae activity. Ashy colored body while tips of legs and claws may turn white-ish. Spending more time around water. Crabs that are missing limbs start to regenerate their limbs by starting to grow a "gel limb" (a gelatinous bud that eventually grows into a regenerated limb) just before a molt. The missing limb will look like it's growing a small, clear, gel-like nub which is actually the limb surrounded by a clear chitin sheath. As molting time approaches, the crab's gel limb will expand and become more defined. Legs and claws may seem droopy or weak. Eye stalks may face away from each other in a "V" shape rather than being parallel. They may also appear cloudy, white-ish, and dull, like a human's cataract.